What’s up? Time for round two of our Triphasic talk. If you by chance missed it (shame on you), then be sure to head over and read it here. You’ll need to be up to speed if you hope to get the most out of this training program, so be sure to check it out. As far as this article goes, it’s going to be pretty brief. My goal is to give you a light overview of the program, and then hook you up with a workout you can crush over the next 9-10 weeks. The exact time frame will depend on whether or not you choose to take a deload, but we’ll get to that later. 1. This is a 9-10 week program with a 3 day workout schedule. 2. Each day is based on a Squat, Bench, or Deadlift Variation. 4. The basic program set up involves three undulated (constantly changing) minicycles broken up by the 3 different phases I talked about in the first article: eccentric, isometric, and concentric. 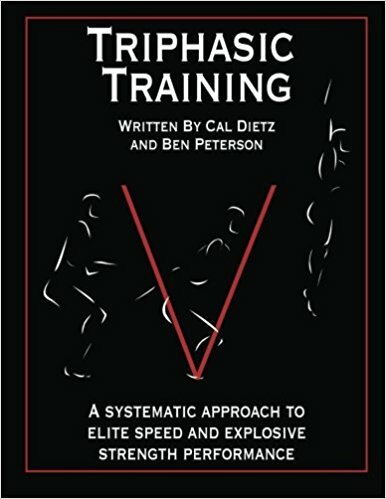 The first 3 weeks are eccentric focused, the second three are isometric focused, and the last three weeks go back to a regular (but explosive) tempo. 5. Like the original set up Dietz and Peterson detailed, there will be a moderate intensity/volume day, a high intensity/low volume day, and a low intensity/high volume day. 6. The intensity of the day applies to only the auxiliary work, while the intensity of the main lift will increase 5% each week. 7. Even though most of the program is below 80%, you will still get stronger by the end of the program. This 60-80% is what Dietz and Peterson describe as the “High Force, High Velocity” block. Ultimately, the sub-max nature allows you to continue training without getting too beat up, while also letting you play in any leagues or pick-up games you may have going on. Remember, with this set up, conservative is always better! 8. I would suggest you taking a deload week after the isometric block. Just throw together a 2 to 3 day training week that’s more volume based rather than intense, and you should be good. 9. As I previously mentioned, the sub-maximal nature of the program allows you to keep up with any activities you may have going on outside of training, so feel free to do so. 10. I would encourage you to do some lighter cardio on your "off" days. For ideas on how to program your conditioning, check out James’ webinar here or this post on aerobic development. Do keep in mind that this is merely one set up out of thousands! The world of triphasic programming is a big one, but I wanted you to get your feet wet and this is a great program to do it on. Once you run through the program, feel free to plug in your own auxiliary lifts, change the main lifts, change the emphasis, change the percentages, etc. and make it your own. I also know a lot of people reading this site, and maybe even you, are in your post-playing days. That's not to say your an ex-athlete, it just means you no longer play your sport of choice competitively. If you fall in that bucket, feel free to throw in an extra upper body day because who doesn't believe in the “Sun’s Out, Guns Out!” lifestyle. If you have and/or come across any questions while going through the program, feel free to post them below in the comment section or hit me up on facebook. Lastly, be sure to keep track of your numbers, because we want to know how much progress you've made.